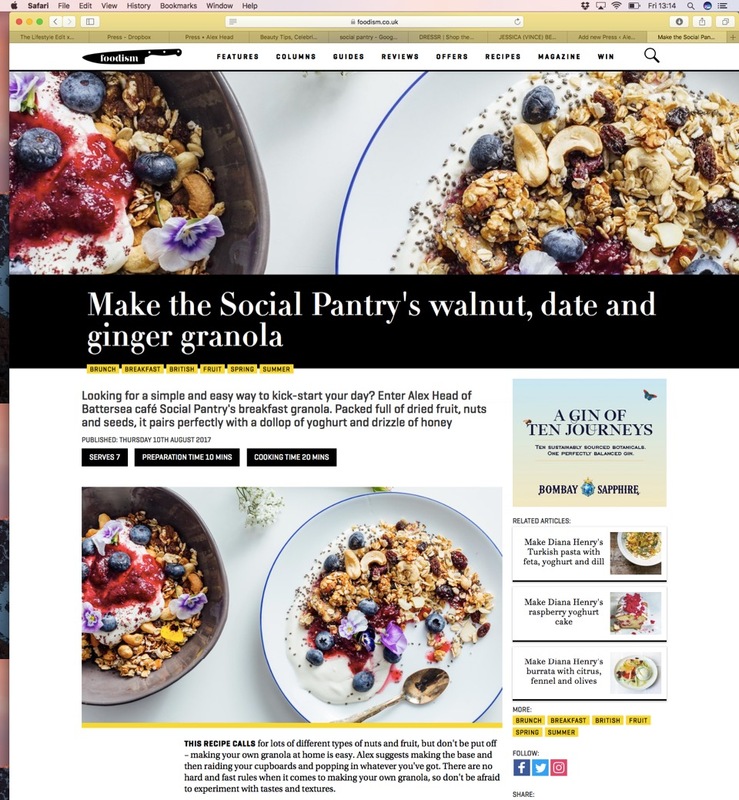 It's always a joy to see Social Pantry in print so it's great to be featured (again!) 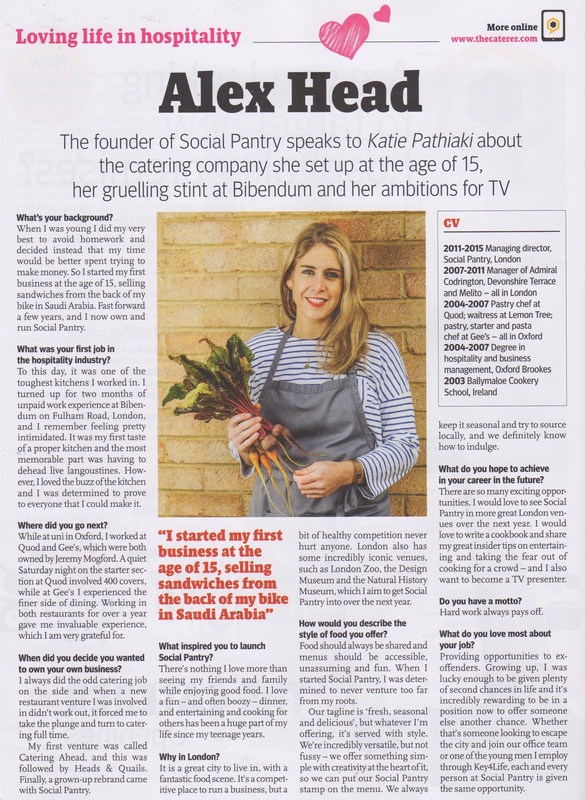 in the May issue of Sainsbury's magazine. 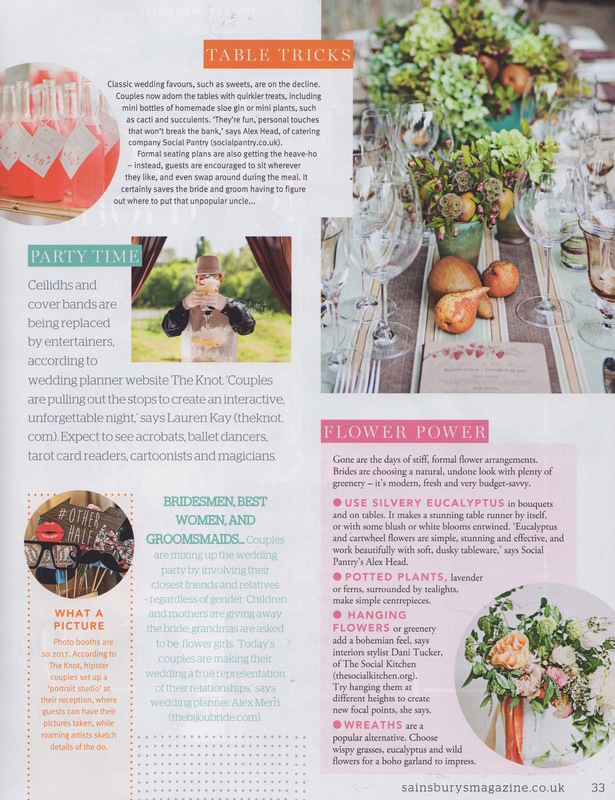 Pick up a copy this month to discover my table tricks for wedding favours and the big wedding edit. 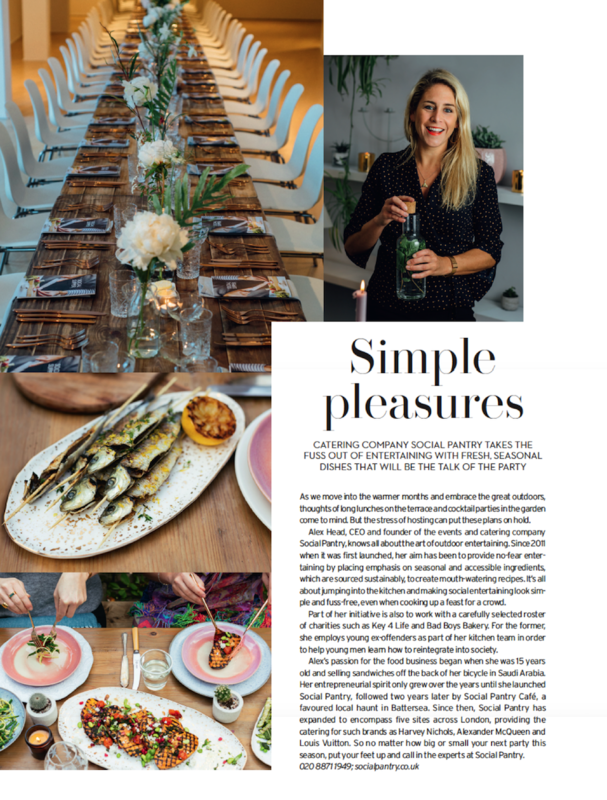 'Simple Pleasures - Alex Head, CEO and founder of Social Pantry, knows all about the art of outdoor entertaining.' 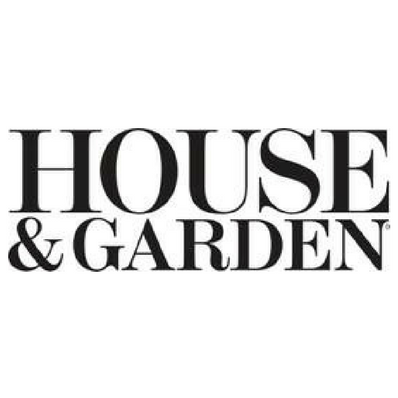 It was a pleasure to catch up with House & Garden magazine for their summer entertaining feature! 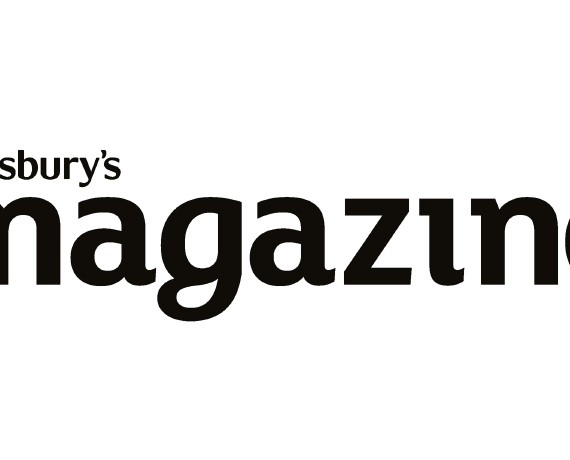 I'm thrilled to see a selection of my seasonal, fresh and delicious Spring recipes featured in the March issue of Sainsbury's magazine. 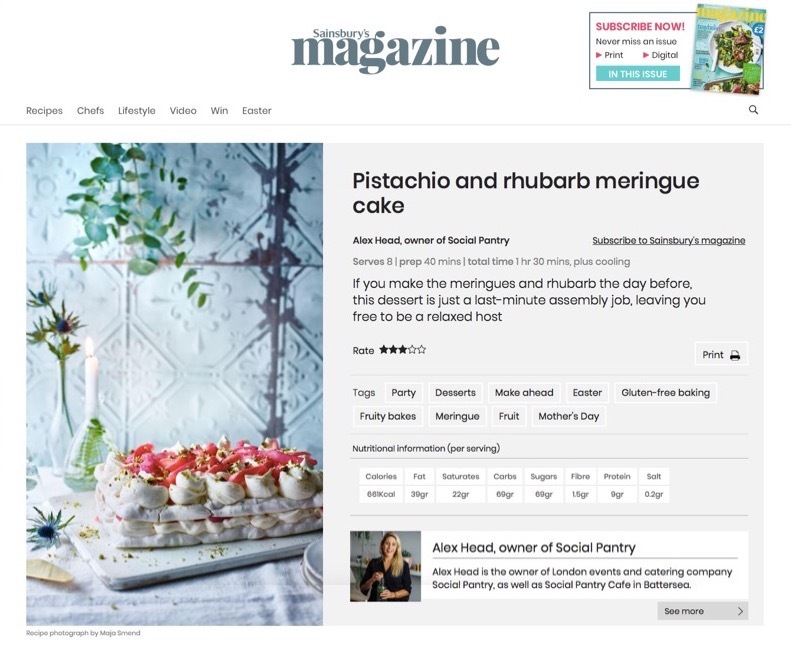 This pistachio and rhubarb meringue cake is perfect for making the day ahead to leave you free to be a relaxed host. 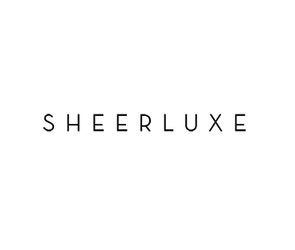 "Alex Head may have started her career in the food industry selling sandwiches from the back of a bicycle, but since founding the Social Pantry in 2011 she has become one of London’s go-to caterers." 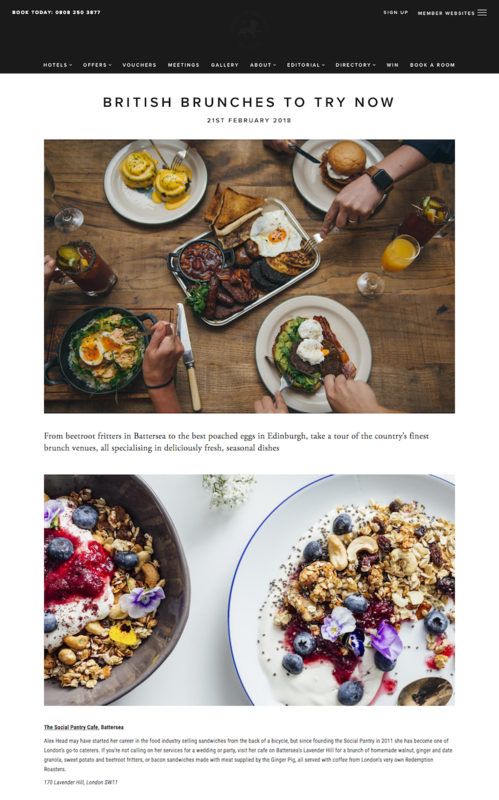 Big thank you to Pride of Britain Hotels for including Social Pantry in their best brunch feature! Activated Charcoal Pancakes - as much as I love a traditional stack of steaming pancakes, why not try something different this Pancake Day? 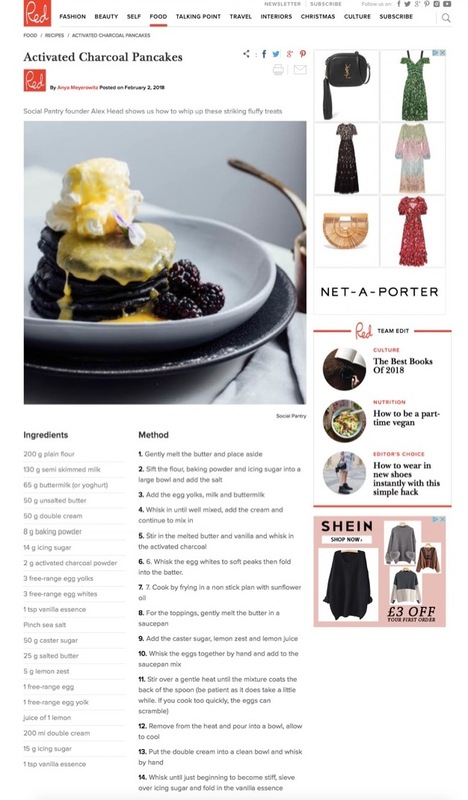 My delicious recipe for these striking activated charcoal pancakes with lemon coulis recently featured on Red magazine. 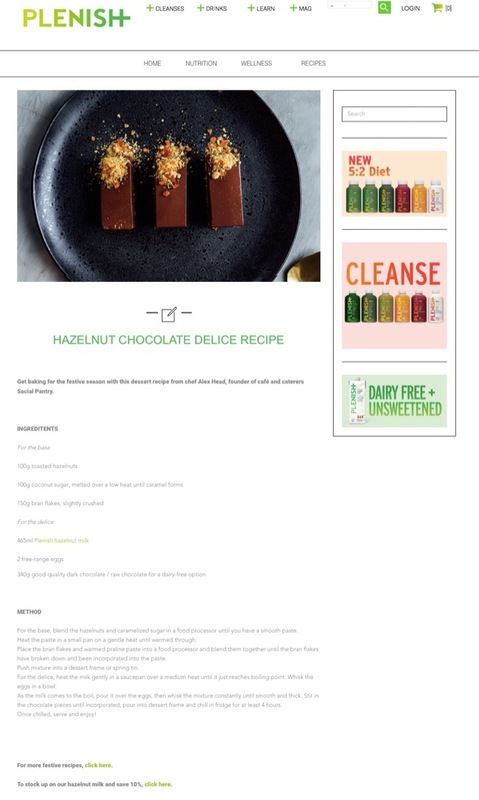 Get baking over the festive season with my decadent hazelnut chocolate delice recipe for Plenish featuring their delicious dairy-free Hazelnut M*ilk. 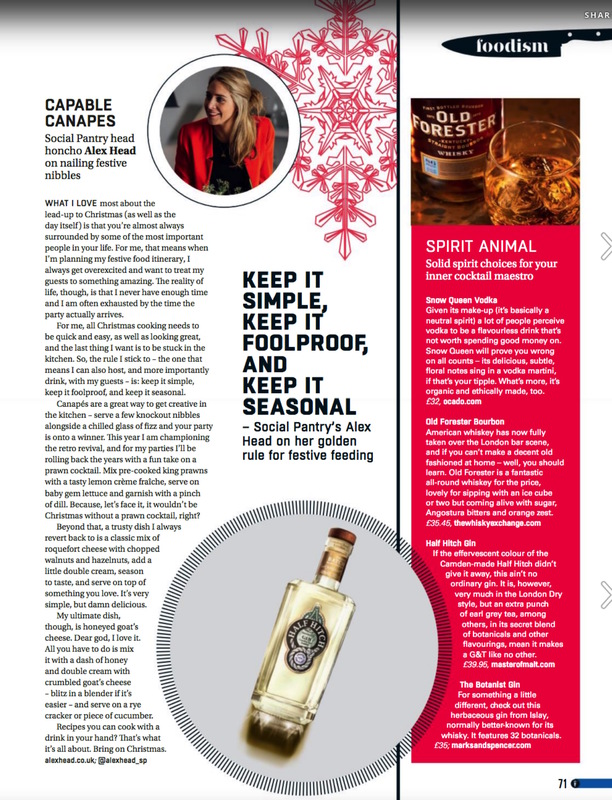 "Capable Canapés" - discover my top tips for creative and delicious Christmas canapés in my column from the latest issue of Foodism magazine. 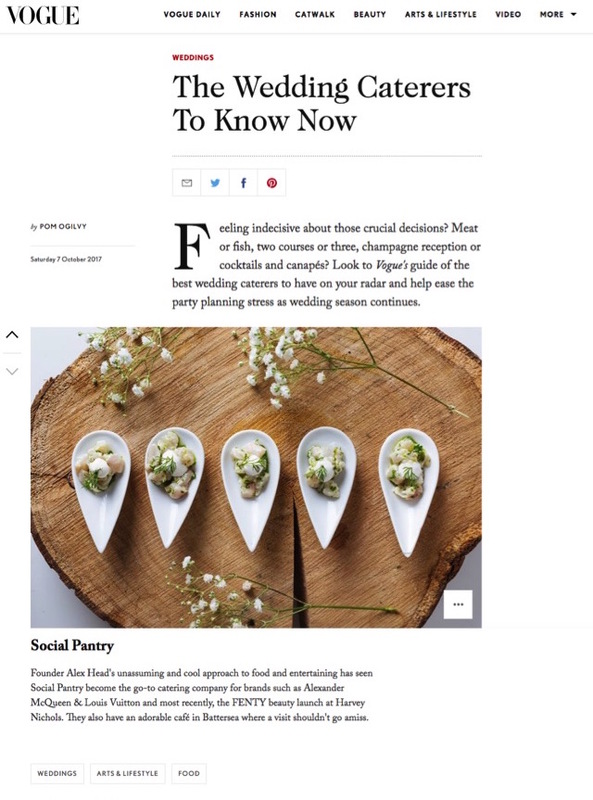 "The Wedding Caterers To Know Now" - I've been selected by Vogue as one of the best wedding caterers to have on your radar and to help ease the party planning stress. 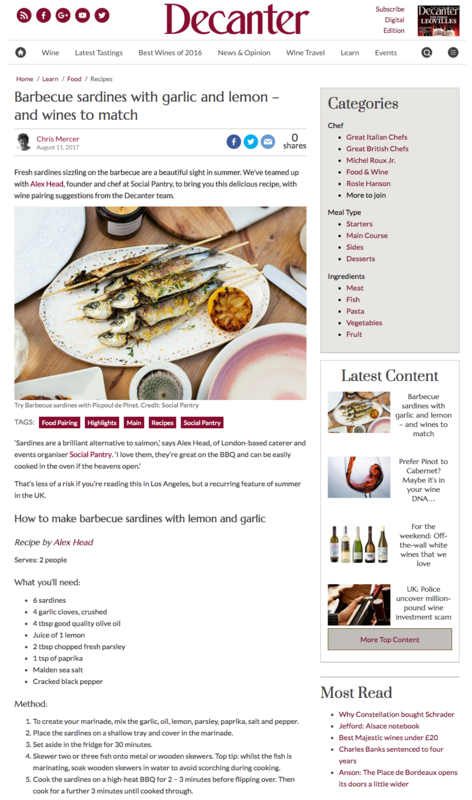 I teamed up with Decanter to bring you this delicious grilled sardines recipe with wine pairing from the experts. 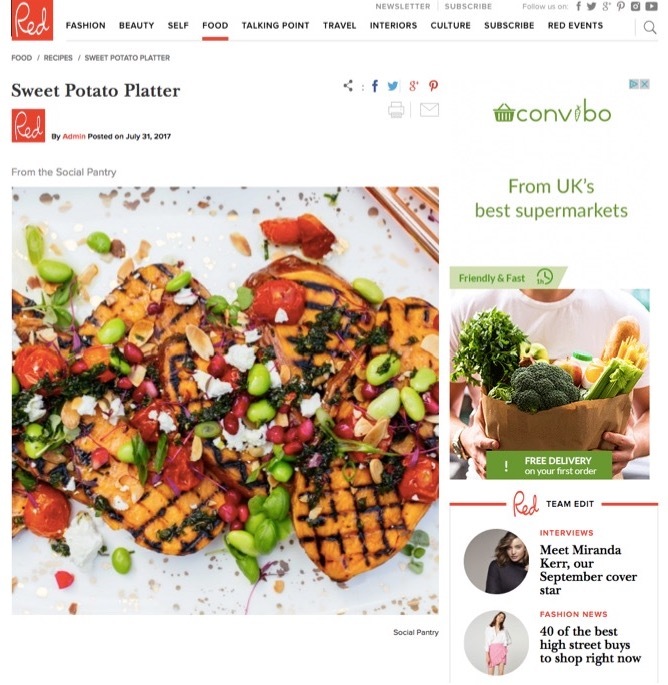 Sweet Potato Platter - my delicious summery recipe for this wonderful sharing platter recently featured on Red magazine. 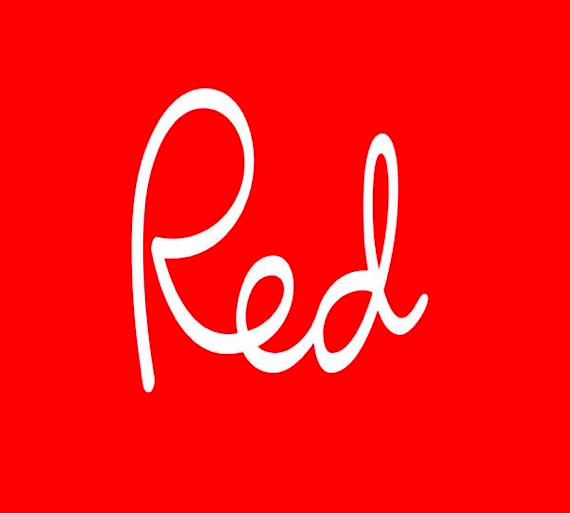 Perfect for BBQ's and al fresco dinner parties! 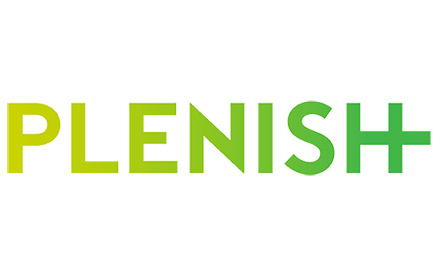 Looking for a simple and easy way to kick-start your day? Enter my breakfast granola recipe as seen on Foodism. Packed full of dried fruit, nuts and seeds, it pairs perfectly with a dollop of yoghurt and drizzle of honey. 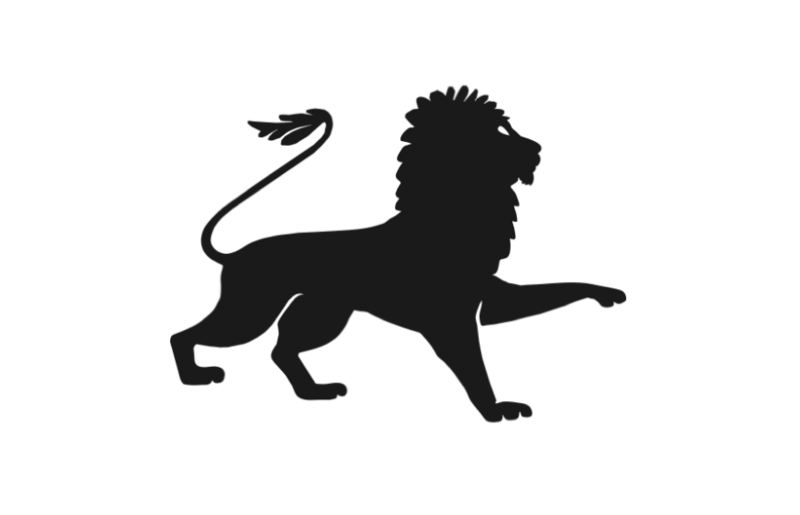 'Game, set, match! 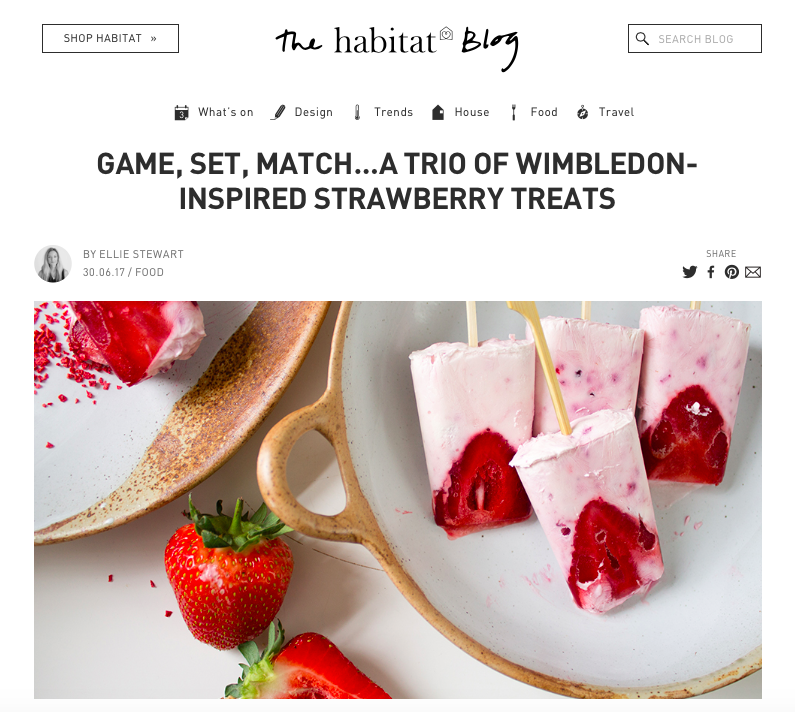 A trio of Wimbledon inspired treats' - I created three seasonal and totally more-ish recipes for Habitat to celebrate the glorious strawberry. Whether you’ve got tickets for Centre Court or if you’re planning your own Wimbledon screening, give my strawberry trio a whirl and you’ll be on to a winner. 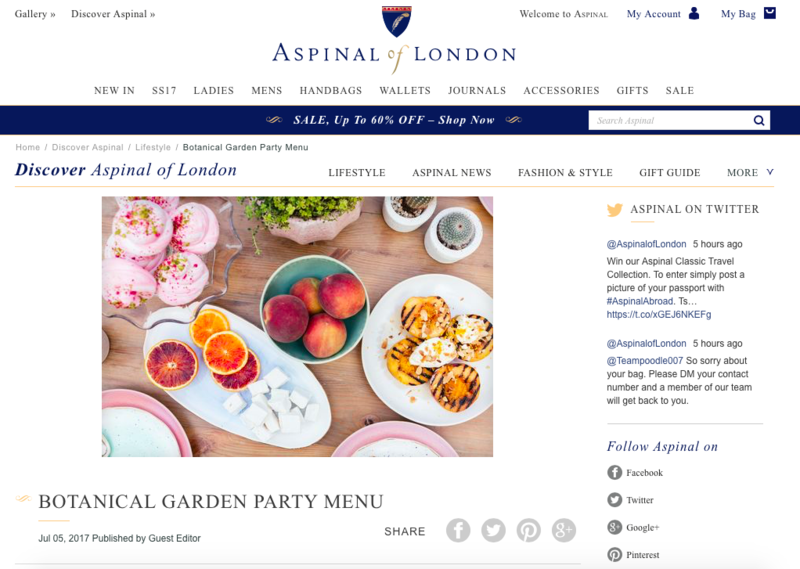 'Botanical Garden Party Menu' for Aspinal of London - what better way to make the most of sunny evenings than to throw a garden party for your friends and family?! 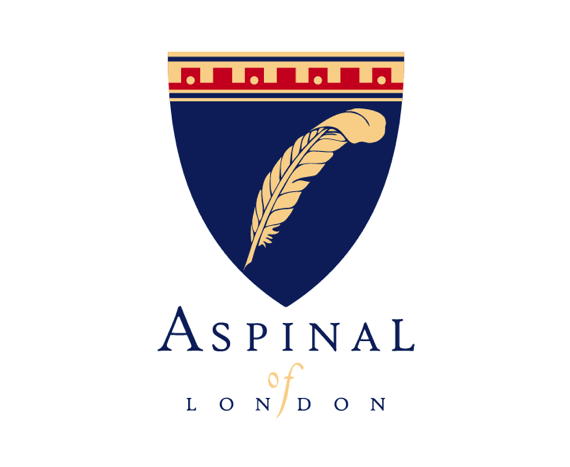 Find my recipes and entertaining tips on the Aspinal website. 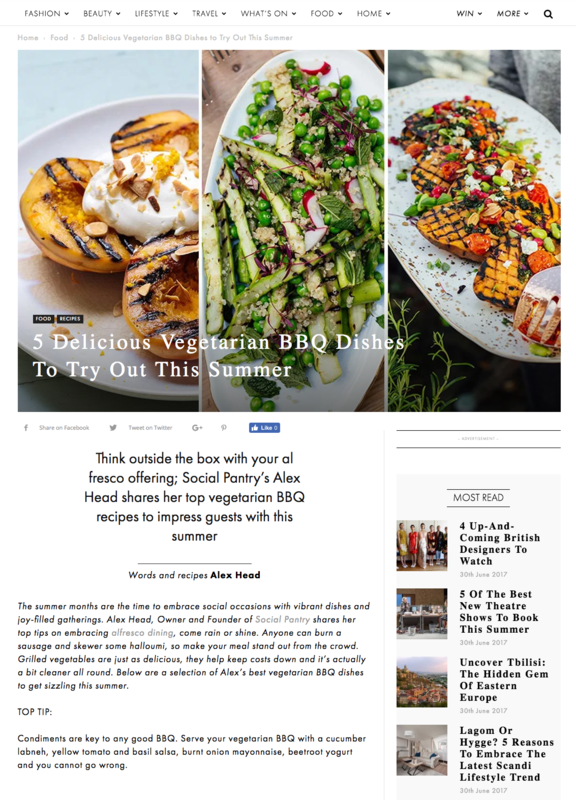 ‘Delicious Vegetarian BBQ Dishes’ – anyone can burn a sausage or burger but why not make veggies the star of the show and embrace seasonal veg?! 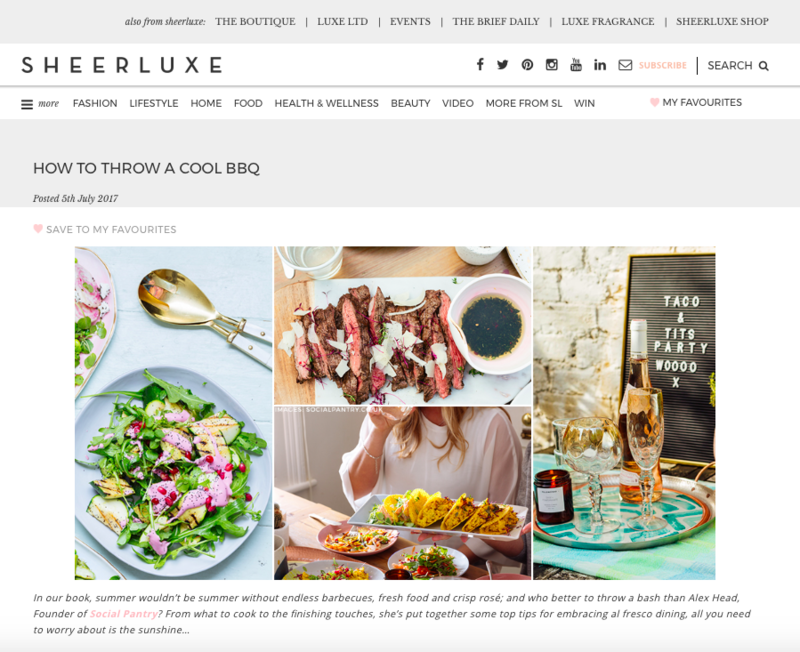 Absolutely London included five of my vibrant barbecue recipes to impress your guests this Summer. 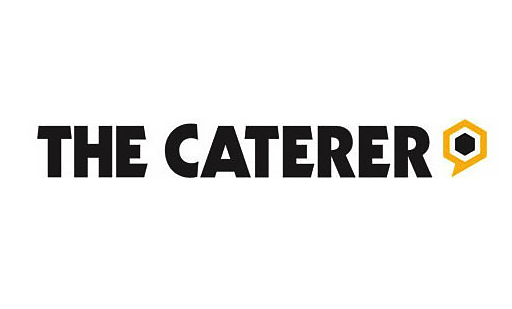 I caught up with The Caterer magazine for their Loving Life in Hospitality feature to talk catering, business and my future ambitions for Social Pantry and beyond.